Marisol's mother Romelia calls Choroní from Caracas. "I have to tell you something," she says, a smile in her voice. Romelia, on the board of the Venezuelan Society of Film Directors, has just been holding a meeting with the director, Margot Benacerraf, and a young TV producer, to start organizing an international film festival for Caracas. In the middle of the meeting, the producer suddenly turned to her and asked, "Are you the mother of Marisol Barrios?" Surprised by this off-the-subject question, Romelia hesitated. "Why, yes?" Both women looked at him curiously. "I've had an obsession over her since I was three-years-old." "Yes, she was a friend of my older sister," he confessed. "She was my ideal woman. When I was a boy in school, they asked me to draw a picture. All I could think of was Marisol. I drew her picture and won a prize. They used it for the cover of our school magazine." The two women were in hysterics for an hour. "And I told him you were living right here in Venezuela," Romelia says. "You didn't," Mari laughs. "Now I'll have to get busy losing weight and working on my suntan." This evening, Marisol and I are out with the girls—old school friends Elizabeth and Beatriz. The three women are feeling much more feminine these days, having visited a miraculous diet doctor and shed countless kilos. This sudden urge to lose weight began with Bea's niece—a naturally beautiful young woman who had allowed herself to grow to elephantine proportions. What a shock then, when Beatriz ran into this same girl one day, no longer rotund, but reduced to the classic lines of a high-priced model. What joy! What pride! What envy! "Wow! What happened? How did you do it?" "Dr. Fabiola Mata in Guarenas. She's fantastic." Quite naturally, Bea, who had also allowed herself to slide into over-ripeness through many years of hearty appetite and natural neglect, saw a lovely reflection of her own new possibilities. A couple of months later, when Mari and Elizabeth next saw Beatriz, they too could not believe their eyes. This couldn't be the Bea they had become so used to. This elegant wraith! This vision of Pre-Raphaelite maidenhood! And thus, like a nuclear chain-reaction, which I'm sure by now has reached the very borders of Venezuela—What joy! What pride! What envy!—Mari and Elizabeth couldn't get to Dr. Miraculous Mata fast enough. The world is suddenly looking at these women with new eyes. Elizabeth's son Pedro, so proud to see his mother slipping back toward her earlier coltish self, sent her off to Miami to buy new clothes. And Marisol. My god! The transformation has not been merely physical, for I've noticed a renewed self-confidence, a revived femininity, a certain kittenish girlishness. "But Marisol?" friends cry in surprise. "Sí, perdí una esposa y encontré una chica," I lament, languishing in my own sloppy excess and decrepitude. "I lost a wife and found a little twist-and-twirl." I see myself growing horns like those old men in Molière. This evening, the ladies have chosen to show themselves off at a new nightspot frequented by the young and fashionable of Caracas—Cañas y Tapas. The music is loud, the light bright and the crowd up for a good time. Eyes naturally turn, wondering what these three young lovelies are doing out with such an ancient specimen. Ignoring their gaze, we grab a table and our first quick round of frozen Margaritas. Having grazed for months on a skimpy diet of slender sprouts and dry rye crisps, the three ladies attack the sumptuous menu of tapas with a more than lustful appetite. Spanish potato omelets, sausages, shrimp and baby eels vanish from the table as quickly as they can be ordered. 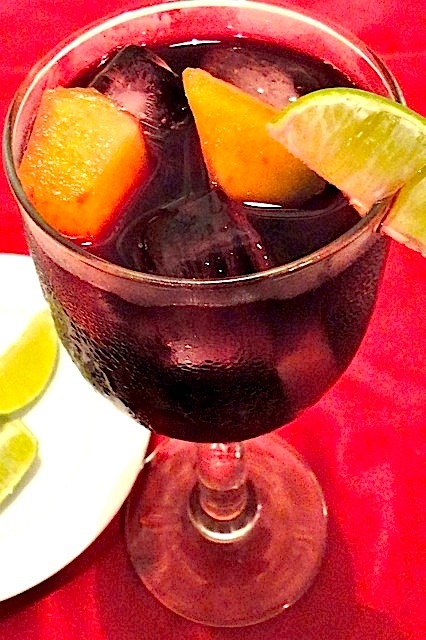 Rounds of Margaritas are gradually replaced by pitchers of Sangria. The crowd around us, though still smiling and chatting, seems subdued next to the revelry at our table. Perhaps because their attention has been drawn to a large color television over the bar, now showing a tight close-up of our President Hugo Chavez. My, but he's gained weight, I'm thinking. I'd venture to say he's gained all the kilos my lovelies have lost. His collar is bursting at the seams. Chavez is in the midst of one of his lengthy orations, haranguing against the Venezuelan oligarchy, which has now grown to include most of the middle class, the commercial, academic and medical communities, as well as the labor unions. His latest attack focuses on the news media—prevaricating TV channels and corrupt newspapers who dare to criticize the revolutionary work of his Fifth Republic. There is a peculiar method of showing political displeasure in Venezuela—the loud and insistent beating of pots and pans. Whenever Chavez speaks, which is more than often, someone out there is sending out a metallic drumbeat in reply. The other day, after Chavez had delivered one of his lengthy speeches at the United Nations, he was greeted on the sidewalk by a group of Venezuelan women, all chanting and banging their pots and pans in protest. Now, absent pots and pans, the restaurant erupts in a sudden thumping of table tops, stomping of feet and clanging of spoons on glasses and plates. And when the proprietor wisely shuts off the television, cheers erupt. Enter Claudio Fermin, the politician, with a group of friends and the cheering in the restaurant swells to a fevered pitch. Claudio is a big, handsome black man with a deep, modulated voice. He glides between the crowded tables greeting his admirers with all the commanding grace of James Earl Jones, minus of course the malice of Darth Vader. One would think Claudio would be the perfect candidate for Venezuela, but although he was once the mayor of an important borough of Caracas and argued wisely and eloquently during the televised writing of our new constitution, his political star has not risen. Perhaps because his positions are too sophisticated for a Venezuela thinking these days in the simple black-and-white terms drawn by Chavez. Only here in this more elite company, in clear opposition to our demagogic president, could he get such a glowing response. The music beats faster, alcohol flows through our veins. All at once, Elizabeth rises from the table. "Where you going, Elizabeth?" we ask. "You'll see," she says, a tall, dark woman with all the unadulterated determination of a herd of wild bison. A force, once in motion, not to be messed with. She crosses the floor in a straight path, straying neither to the left or the right, but directly to the table where Señor Fermin sits talking to friends. She leans forward, whispering in his ear. He smiles, rises toward her and they begin to dance. They dance to a slow bolero, chatting intimately like acquaintances of long standing. All eyes are turned toward them. Who is that dancing with Fermin? When they finish, he inclines slightly, taking her hand, thanking her. Is that a glow across his face? "But, Elizabeth, what did you say to him?" we ask. "I told him I made a bet with my friends that he would dance with me." Claudio looks across at us and smiles. But what will happen now? Will Elizabeth continue with this reincarnation, shedding even more kilos, until every Claudio and his like will not be able to stop dancing with her? Will Mari and Bea forsake their old men and go on to more lively lives? Or will they, like so many before them, tire of their sprouts and rye crisps, one day say, "What the hell?" and return to their lustier profligate ways?